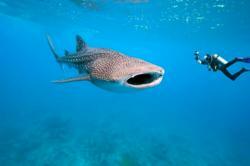 Travellers wishing to experience the spectacular annual whale shark migration to Belize had better begin preparing now if they want to make the most of this rare opportunity, according to the Belize Natural History Centre at Chaa Creek. Ms Fleming also noted that new direct flights from neighbouring Maya Flats to the coast and the Belize Great Barrier Reef are making this year’s annual whale shark migration and a host of other Caribbean Sea adventures even more accessible. The whale shark is the world’s largest fish and the third largest animal on the planet. Long known in Belize as “Sapodilla Tom” due to its penchant for staying at the Sapodilla Cayes and Gladden Spit during its annual feeding and breeding season, the whale shark has a recorded length of 12.65 metres (41.50 ft) and weighs in at more than 36 tonnes (79,000 lb). Although they are true sharks (Rhincodon typus) that have changed little over the last 60 million years, whale sharks are peaceful creatures, allowing divers to come close as they lazily strain plankton and other food during their annual stopover in Belize. Bryony Fleming, who coordinates tour packages and bespoke excursions from Chaa Creek, said that the increasing numbers of people coming to see the gentle giants is another indication that more and more people are discovering the attractions of this laid-back little Caribbean country. Ms Fleming said recent media attention such as National Geographic’s pictorial features have spurred interest in the whale shark’s stopovers in Belize, which is one of only a few destinations these giants choose for their annual mating and feeding gatherings, with Madagascar, South Africa, Australia, Mozambique, Indonesia and the Yucatan also acting as annual hosts. During the full moon, Cubera and mutton snapper spawn around the Gladden Spit area and the whale sharks come to feed on the rich spawn and to mate, swimming slowly near the surface, consuming small crustaceans, plankton, small fishes such as sardines and anchovies, and even larger fishes such as mackerel before having a rest on the bottom. They are curious creatures, and have been known to approach boats and allow themselves to be petted. The annual whale shark season begins in March in Belize and continues through April, May, June and some years even further into the summer. Full moon periods are the best times to see these beautiful giants, and last year’s prime viewing times were March 17 -31, April 16 – 28, May 15 -27, June 13 -25. Ms Fleming said that while there are no guarantees that they will be seen, villagers in Placencia and Hopkins villages keep tabs on their movements and pass that information on to Chaa Creek’s naturalist guides. “Even if you don’t get to see these magnificent creatures, the excursion out to the reef is a beautiful experience and you’re guaranteed to see plenty of other marine life,” she said. Ms Fleming also noted that new direct flights from neighbouring Maya Flats to the coast and the Belize Great Barrier Reef are making this year’s annual whale shark migration and a host of other Caribbean Sea adventures even more accessible to Chaa Creek’s guests. “Our Rainforest to Reef packages give travellers a rare opportunity to experience Belize’s inland treasures, such as our beautiful rainforests dotted with Maya temples and spectacular remnants of ancient cities as well as the stunning Caribbean coast and Belize Great Barrier Reef in one easy and affordable Belize vacation package. “And now with Tropic Air offering direct flights to the coast and Ambergris Caye, there never has been a better time to experience Belize’s many natural wonders. People soon discover that the whale shark migration is just one of many incredible experiences that await visitors to Belize,” she said.